Salt Lake City, Utah, September 19, 2008 — To accommodate the growing need for alternative heating solutions, Warmzone introduces the ECO-heater, an innovative electric wall-mounted room heater. The ECO-heater signifies an advancement in residential and commercial heating, and runs completely independent of harmful fossil fuels. Many homes have outdated, inefficient heating systems that are costly to run. Oftentimes, retrofitting a home with alternative green heating methods is time consuming and costly. However, the ECO-heater makes it possible to be “green” and switch from gas heating to electric heat in less than a single afternoon, without breaking the bank. A single wall-mount ECO-heater effectively heats an entire 10×12 foot room and is up to 75 percent more efficient than other whole room heaters. A unique feature of the ECO-heater is the ability to paint it any color that you want, allowing you to match the decor of your room. 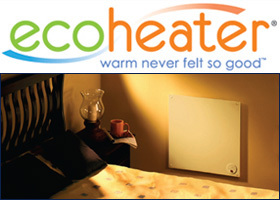 Another attractive feature of the ECO-heater is its silent, heat generating performance. Traditional forced air room heaters cause drying of the skin; however, the ECO-heater operates without the use of noisy fans and air blowers, giving you added health and comfort benefits. The technology is behind the wall-mount heater is simple. Using convection air technology, air is drawn into the 1-inch gap between the wall and the heater. The heated air rises from the top of the heater and produces a natural circulation of warm air around the room. Because the ECO-heater only reaches a surface temperature of 165 degrees Fahrenheit, it won’t burn the skin and can be mounted anywhere in the room. Wall-mount heaters take up little space, and aren’t at risk of tipping over and causing fires. In addition to home heating, ECO-heaters are great heating solutions for garages, drafty room additions, and keeping livestock warm in barns and enclosed areas because of its safety features. Whether you want to switch your entire home to electric heat, or want an alternative heat method to reduce the usage of your gas heaters, the ECO-heater is clearly an ideal choice. Using products that support renewable energy sources such as solar, wind, biomass, geothermal and hydro-power methods in your home is an easy way for everyone to do their part to help the environment. The best part – you get to save money while you do it! The ECO-heater wall-mount heater doesn’t require hardwiring or an electrician to install. It plugs easily into standard AC outlets and can be used with plug-in or hard wired thermostats. The installation kit that comes with each ECO-heater makes it easy for everyone to begin enjoying the comforts of convection air, wall-mounted heaters today. For more home heating solutions, contact Warmzone. Our professional staff is always available to assist and help you choose the best heating systems that fit within your budget.